This is the quilt that I designed for Kim for her birthday using a lot of batiks and other designs in all of her favorite colors. 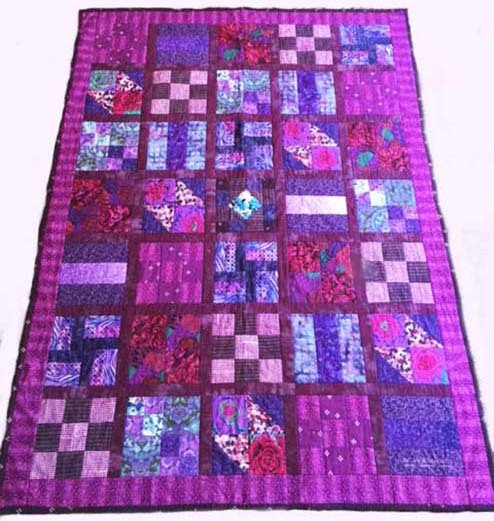 Oh such pleasure I had making this quilt from start to finish. While in North Carolina I went with my niece, Kim to buy some fabric. I know the type of patterns and colors that she likes so we had a lot of fun selecting a few pieces. When I returned to Los Angeles I went to a few of my favorite shops and built upon what we had started with and ended up with 32 different fabrics that are all in the same palette. 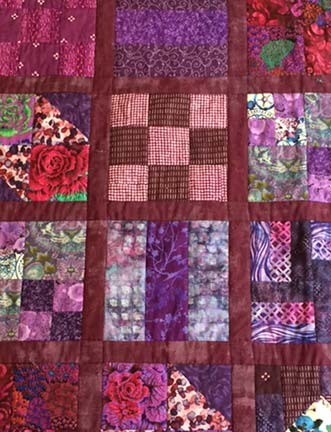 The next part is where I really started to enjoy quilting. 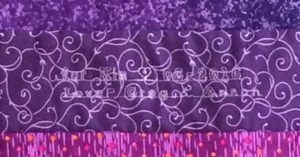 I had previously purchase a quilting software, EQ7, and with that software I was able to completely design a quilt for Kim from start to finish. 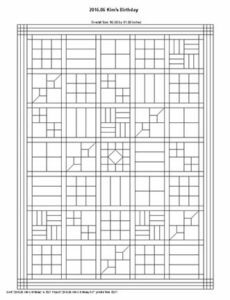 The program takes into account the dimensions of the squares, the border, sashings and bindings. It even gives you the template dimensions and estimated yardage needed for each piece of the quilt. 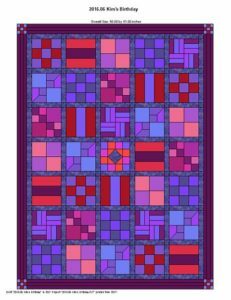 This is the pattern that I created in EQ7 quilting software. This is the template of the pattern after scanning the fabrics and uploading them to the EQ7 pattern. After piecing the quilt I also added a monogram to it so that she will always remember the occasion that I gave it to her. Close-up of the blocks that were assembled for the quilt. I embroidered a very subtle monogram on the front corner of the quilt so that she will always remember the occasion. It means so much to have someone as special as Kim in my life- and even better that she is my niece. And what a SPECIAL day it was! This quilt is a perfect example of just how amazing you are. I’ll always love and treasure it! Every time I use it, I’m reminded of what a special uncle and friend you are to me. I love you, Greg!! Thank you Kim. I had good motivation.